Where art is for everyone. ​The Newburyport Art Association Blog is where a conversation unfolds about the visual arts and its connections to the varied & rich human experience. Join us. Some artists have taken to giving old books a second life. Using the pages of a printed book, carving or sculpting them turns the books into the medium. Whether the artist uses the contents for inspiration or the book becomes a form that morphs into an unrecognizable object, the possibilities are limitless. At the Newburyport Art Association (NAA), we look forward to the Newburyport Literary Festival on Saturday April 29. Every year we are one of the many venues that host a day long city wide festival of books and writers. At 65 Water Street we always enjoy a variety of speakers who read and discuss their work. We thought it would be fun to create a show this year for the occasion. The Art of Books will run in our Hills Gallery from Tuesday April 25 to Saturday April 29. Members and non-members are welcome to submit works of art using books as the medium. More information here on how to submit work. 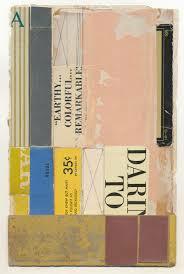 We have provided some amazing examples of contemporary artists who use the medium of books to inspire you. Click the artist's name and you will be directed to their website. An altered book is a form of mixed media artwork that changes a book from its original form into a different form, altering its appearance and/or meaning. An altered book artist takes a book (old, new, recycled or multiple) and cuts, tears, glues, burns, folds, paints, adds to, collages, rebinds, gold-leafs, creates pop-ups, rubber-stamps, drills, bolts, and/or be-ribbons it. The artist may add pockets and niches to hold tags, rocks, ephemera, or other three-dimensional objects. Some change the shape of the book, or use multiple books in the creation of the finished piece of art. Altered books may be as simple as adding a drawing or text to a page, or as complex as creating an intricate book sculpture. We hope you are inspired to make your own altered book art for our show. Information on our website and here. The NAA closes between Exhibitions for receiving works and installing the next show. Check our Exhibition Calendar for show dates.